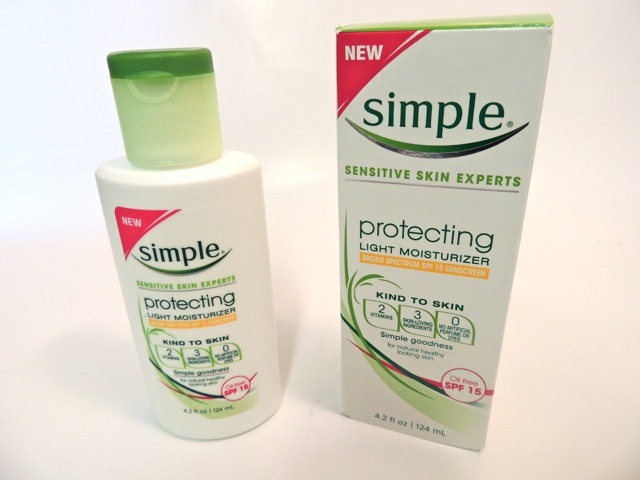 SIMPLE Protecting Light Moisturizer - Give Me Gorgeous! Great for everyday use under makeup. This light moisturizer absorbs quickly and protects skin from UVA and UVB rays – SPF 15. Also contains vitamins B5, E and glycerin, pampers skin with no artificial perfume or dyes. Its also non-greasy and non-comedogenic (won’t clog pores). Good for sensitive skin. Comes in a plastic squeeze bottle with a lid that snaps closed securely, so its safe to pack in your gym bag or throw in your luggage without fear it will come open. So happy I found this product. It provides basic moisture and sun protection. I generally put it on just after washing my face each morning. Because its so light, I wear it under concealer, foundation and even bb cream or cc cream. Even though my skin tends to be oily, this prevents it from overproducing oils and calms skin – doesn’t cause my face to break out. I always find that some of my favorite moisturizers are the simplest! And this once sounds great.